Now that the weather here in central Texas is (Finally! Hopefully!) beginning to feel like actual Fall, my own thoughts are turning to soup. 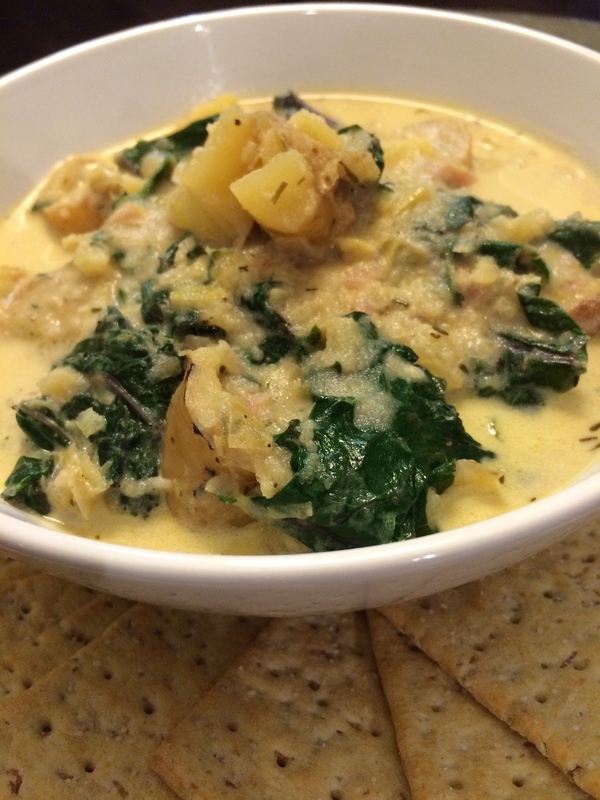 I know you can eat this extremely versatile dish all year, but I prefer the cooler months. It’s honestly difficult for me to enjoy a lovely bowl of soup when it’s 100F outside. This is one of my favorites. It’s quick, simple, easily doubles, freezes well, and is open to variation and adaptation. You can make it vegan, vegetarian, with chicken broth, pureed, or chunky. It’s completely up to you. In my version, I’ve added kale to the soup. 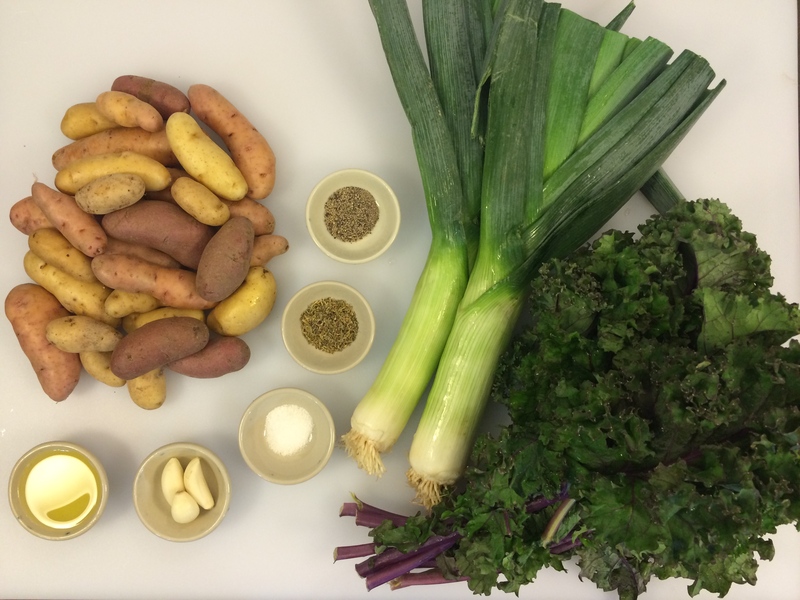 Dark leafy greens are excellent in Potato & Leek Soup. The add a wonderful deep flavor and texture as well as help to stretch the soup a little further (excellent if one is on a budget). Plus, it’s a great way to use leftover greens. I started adding kale for my Aunt Cathy. She would come to visit me in Austin during the wildflower season in the Spring and I would always fix a meal or two for us. 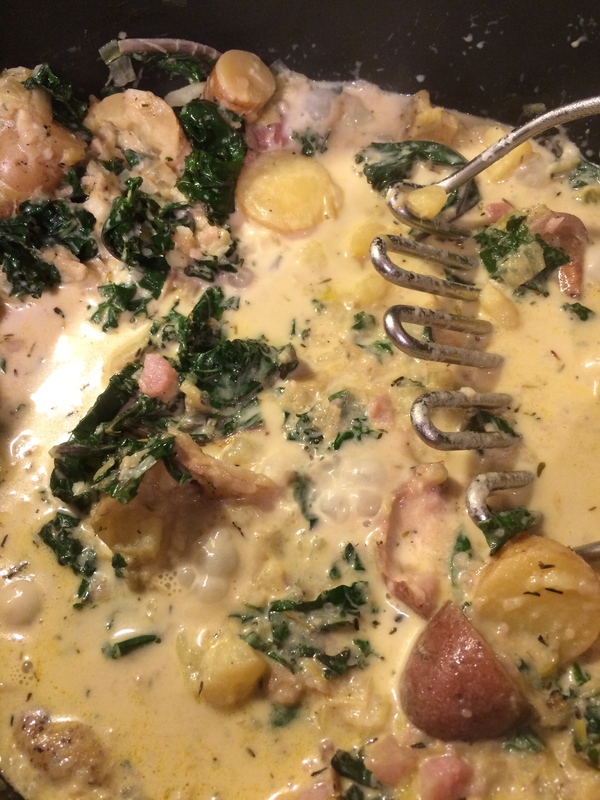 I made this soup during one of her visits and decided to toss some leftover kale in. Cathy was a kale fiend – she loved it. I can’t remember how many bowls she ate, but she certainly enjoyed it. Sadly, she passed away several years ago. So, whenever I make this soup, I think of her. 1. 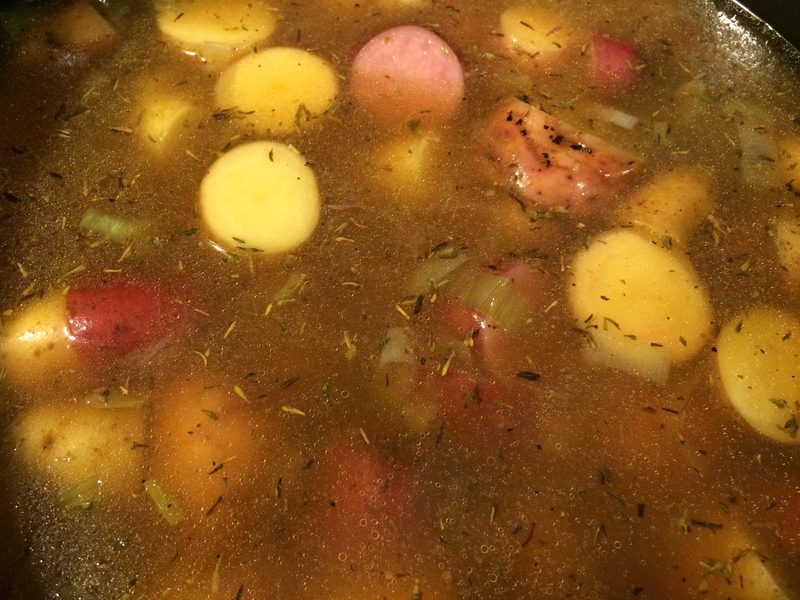 I like to make this soup with waxy as opposed to starchy potatoes. It’s a simple preference. 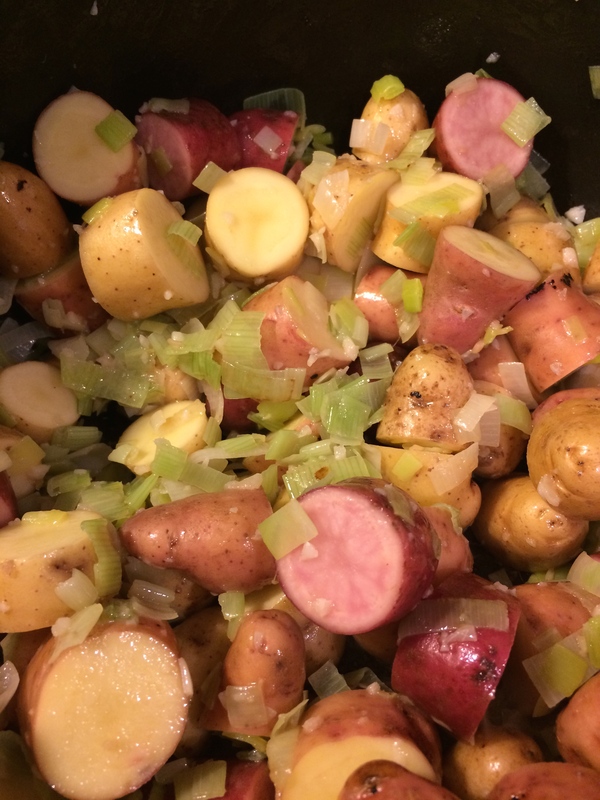 However, if you prefer to make the soup with starchy potatoes (i.e Russet, Yukon Gold), go ahead. I’ve never made this with sweet potatoes, but I’ll bet it’s great. 2. It’s up to you whether you want to peel the potatoes or not. 3. You can puree the soup or not. I generally don’t. I’ll just take my potato masher and mash a few down. While I do enjoy a good pureed soup, I prefer some extra texture for this one. 4. If don’t have or can’t find leeks, you can use one large onion. Just be sure to slice it very thinly. 5. This recipe results in a more stew-like thicker soup. If you want a brothier soup, then add more liquid. Just be sure to adjust the seasonings accordingly. 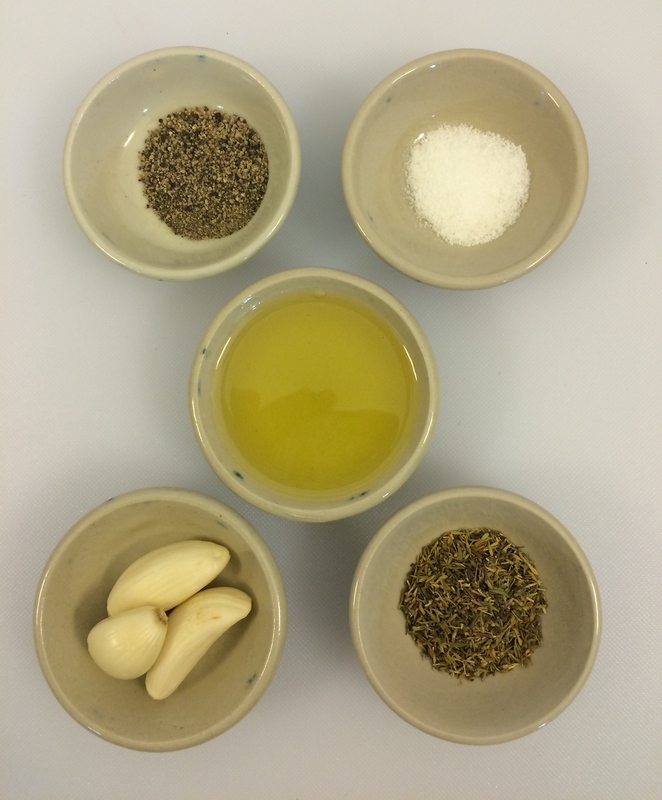 The Ingredients. Not pictured: vegetable broth, cream. 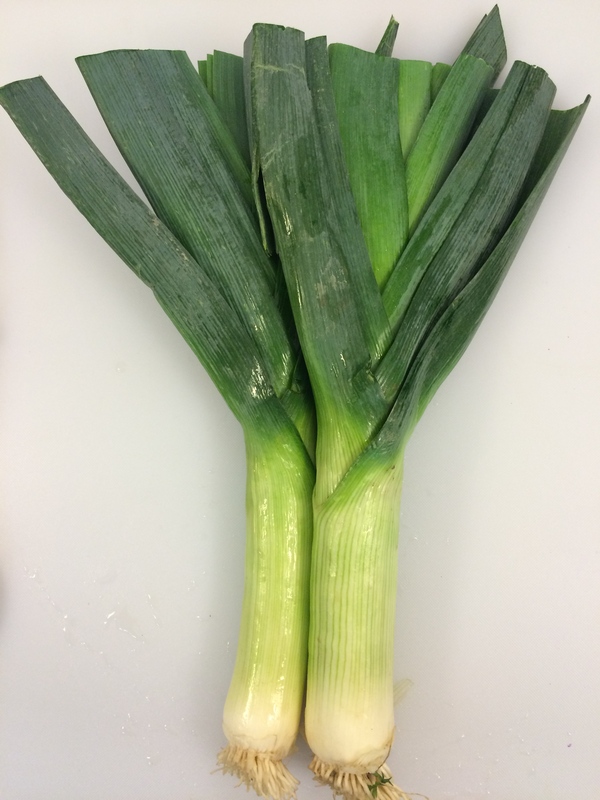 Leeks. They basically look like overgrown scallions. Generally, only the white part is used in cooking. However, you can use the greens as well. I generally save them and use them in stock. 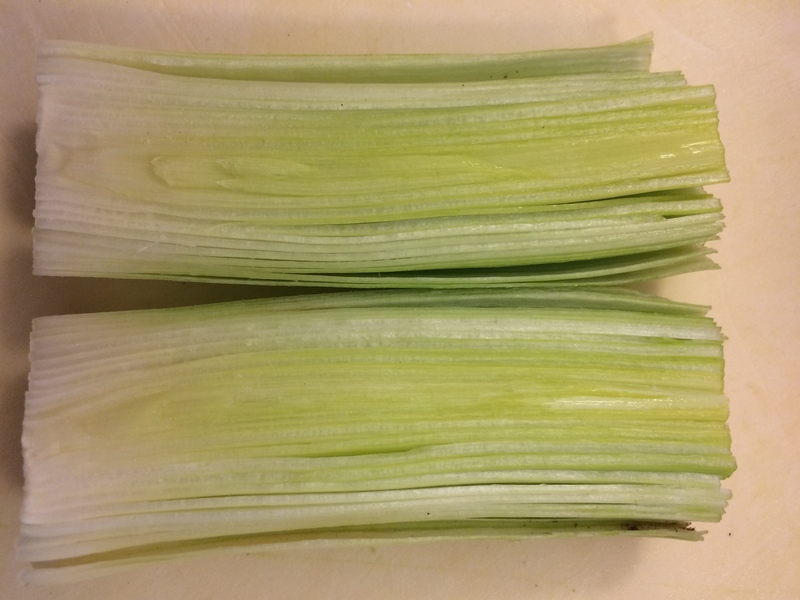 The inside of the leek. As you can see, it’s got layers like any other onion. 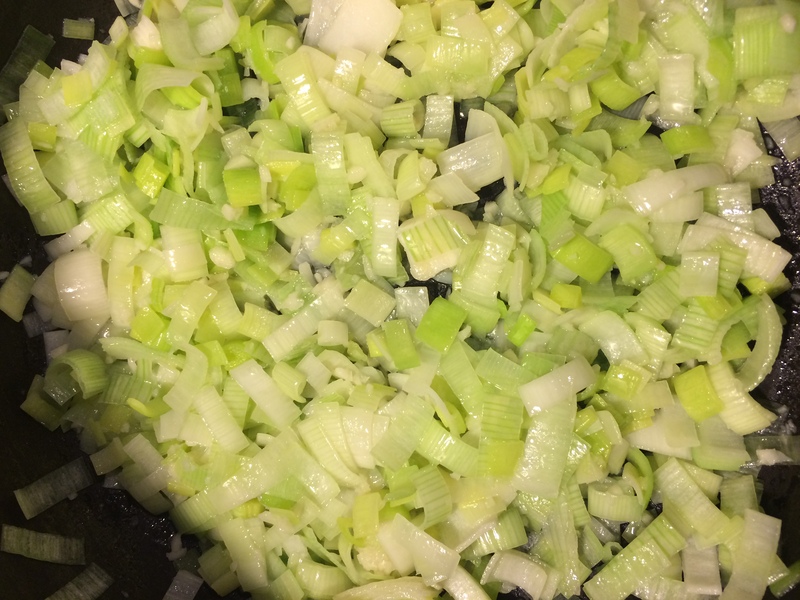 Unlike onions, leeks tend to get dirt in the layers; so, you want to be sure to wash them thoroughly after you cut them. This one was fairly clean, but you can still see some dirt in the lower right hand corner. I chose to use fingerling potatoes this time around. You can use any type you prefer, however. Some lovely kale. Just trim off the leaves and use the stalks for compost or stock. In a large pot over medium heat, heat the olive oil or butter. When the oil is heated, add the leeks and garlic and sauté until the leeks have softened, about 5 minutes. Be sure to stir frequently. Sauteing the leeks & garlic. Stir frequently. You want the vegetables soft, but not browned. 2. Add the potatoes. Cook and stir until the potatoes are coated in the oil, leeks & garlic, and are a little warm, about 5 minutes. 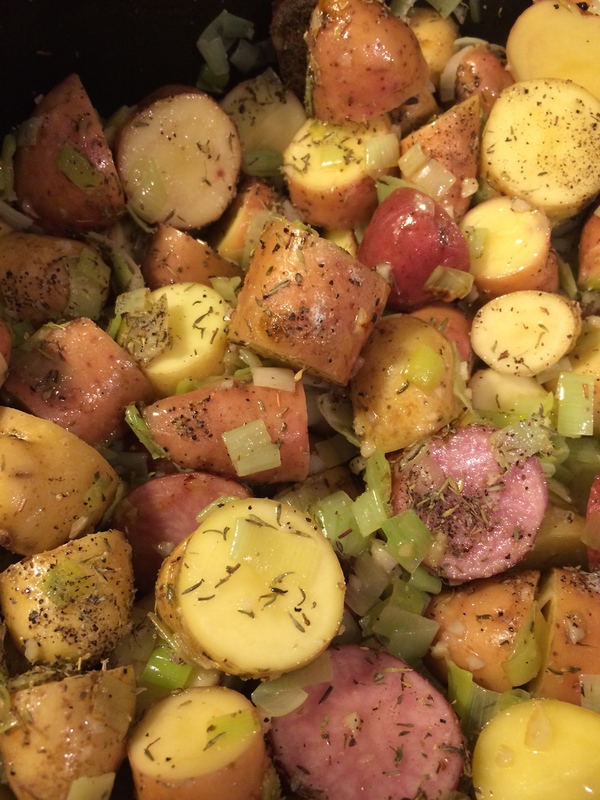 This will help the potatoes jump-start cooking as well as absorb some of the flavor of the leeks and garlic. 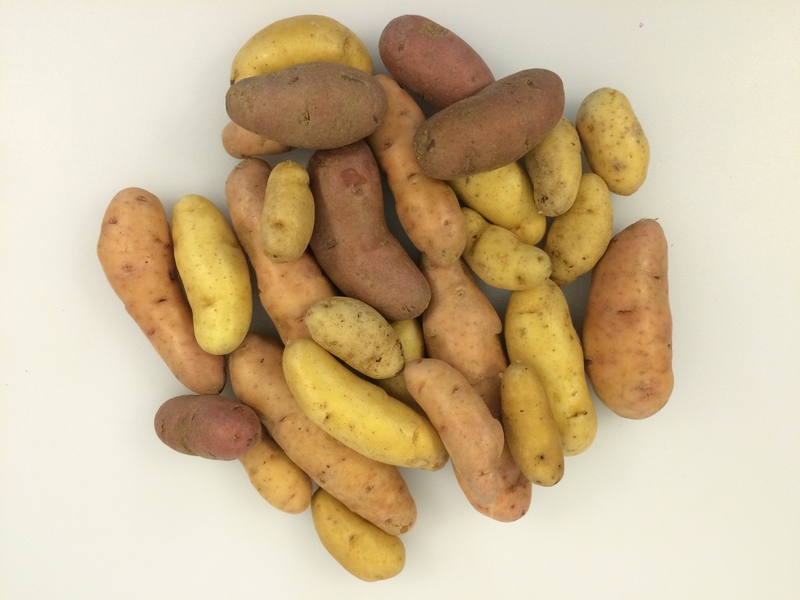 I didn’t realize some of the potatoes were pink (or, I guess, red) until I cut into them. I wonder what would happen if I threw some purple ones in the soup. 3. Add the salt, pepper, and thyme. Cook and stir frequently for another 2 – 3 minutes. Adding the salt, pepper, and thyme. 4. Add the broth. Cover the pot and bring the broth to a boil. Uncover, lower the heat to medium-low, and simmer the soup until the potatoes are fork-tender; about 30 minutes. The potatoes will absorb the broth, so the volume will go down. This is normal. If you feel the soup is too dry, add more broth. However, this is a fairly thick soup and if you decide to add cream, then you may want to hold off on adding any broth. Otherwise, add more broth and adjust the seasonings accordingly. 5. Meanwhile, prepare the kale (is using). 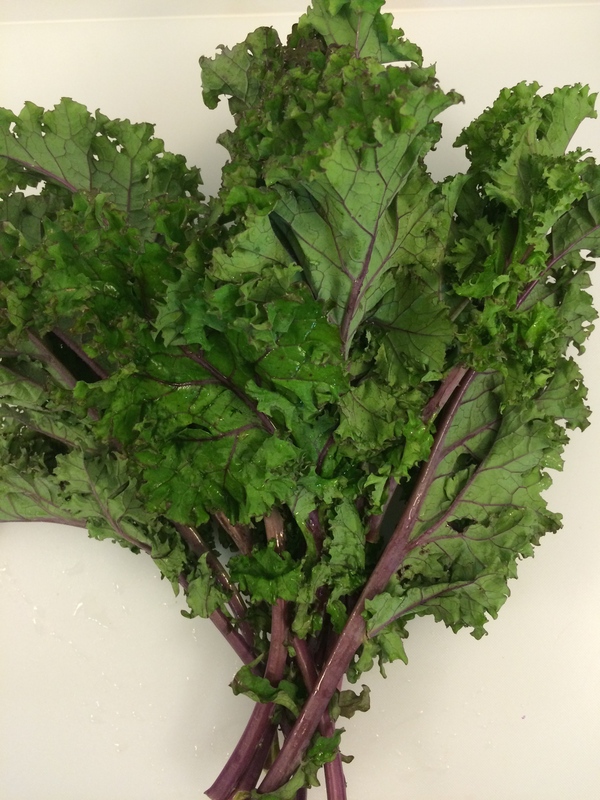 To trim the kale, simply strip the leaves away from the stalks and wash. Don’t tear the pieces too small – you want them still fairly large as they go into the steamer so there will be less chance of the kale overcooking. 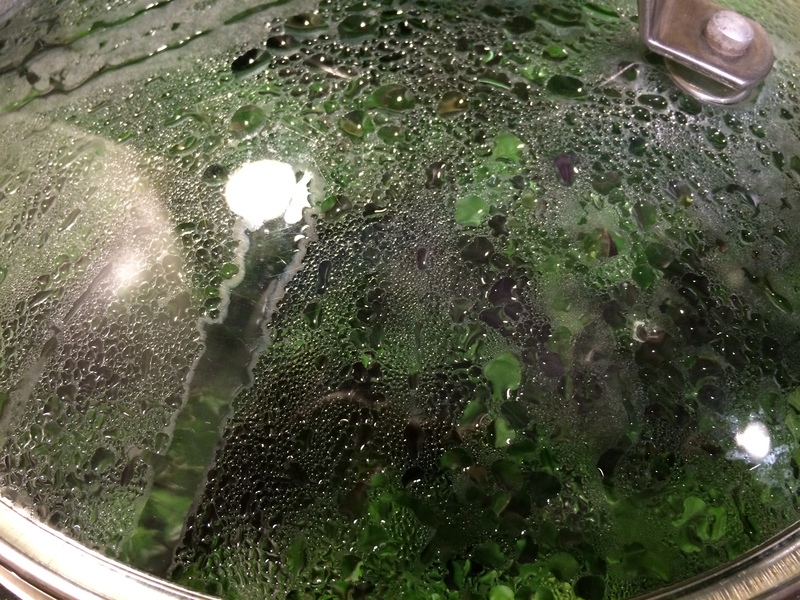 When the kale is ready, take it out of the steamer (the easiest and probably safest way to do this is to dump everything in to a colander; be sure to drain the kale thoroughly if you use this method), place it on a cutting board, and roughly chop it. 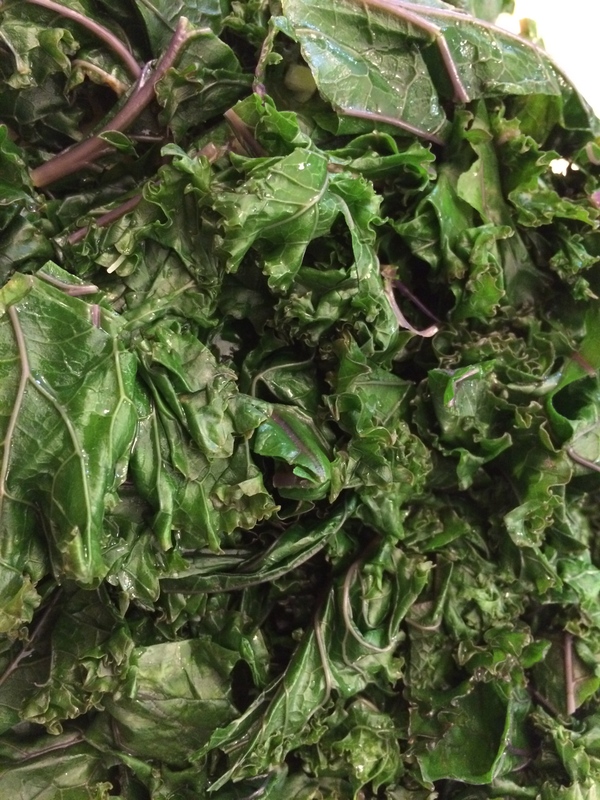 The cooked and chopped kale ready for the soup. At this point you may ask, why don’t you just throw the raw leaves into the soup? Well, because I find the kale (or whatever green I’m using) tends to impart too strong a flavor into the soup that I don’t necessarily want. Steaming the leaves ahead eliminates that factor. I still get the flavor without it overpowering everything else. 6. So the following two photos are an example of do as I say, not as I do. When the potatoes are done take the pot off the heat. If you like, either puree the soup (time to pull out that stick/immersion blender you got as a long-ago gift or impulse bought), use a potato masher (as I usually do), or do nothing (another great option). Once you have achieved the consistency you prefer, add the kale and cream – or whatever it is you’re using – and taste for seasoning. 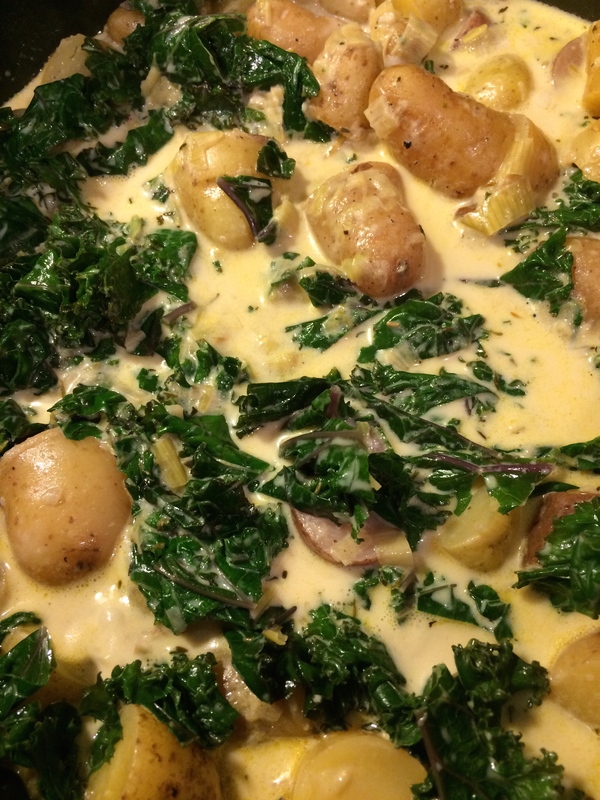 Adding the kale and cream. I did this step a little backwards. So, you want to be sure and take care of the consistency before adding the cream and kale. 7. Finally, time to eat. I like to serve the soup with either some stoneground crackers or a good crusty bread. I love your pictures!!! This recipe makes me wanna run out to the store and buy the first leeks of the season for us. Thanks!! !